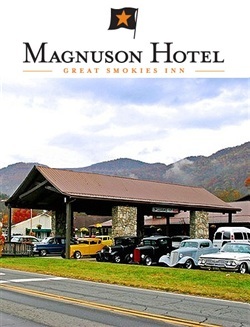 Magnuson Hotels, the world’s largest independent hotel group, announced today the complete rebranding of a Cherokee, NC Best Western as the Magnuson Hotel Great Smokies. Leisure travelers will enjoy this Magnuson Hotels affiliate located at the entrance of the Great Smoky Mountain National Park. As an outdoor hub of Western North Carolina, The Magnuson Hotel Great Smokies is near every outdoor activity imaginable; whitewater rafting, fly fishing, canoeing, hiking, biking and zip line courses. The Magnuson Hotel Great Smokies is also within driving distance of Harrah’s Cherokee Casino, Cherokee Bear Zoo and Exotic Animals as well as many restaurants, museums and shopping. Guests will enjoy spacious rooms with free wireless Internet, an outdoor pool, business center and free shuttle to Harrah’s Cherokee Casino. “Magnuson Hotels is dedicated to the success of independent hotel owners and we are proud to feature the Cherokee region and the Magnuson Hotel Great Smokies as a top leisure destination,” stated Thomas R. Magnuson, CEO. As a Magnuson Hotels affiliate, the Magnuson Hotel Great Smokies will receive total brand representation across North America and the UK. All direct revenue to the hotel is non-commissionable and royalty free. The Magnuson Hotel Great Smokies is backed by the quality standards of the world’s largest independent hotel group. The hotel will also receive a 10% brand rebate, paid every six months.